Positioned in the Umaria District of Madhya Pradesh, Bandhavgarh National Park is a home to exotic species of flora and fauna especially tigers. Spread over an area of almost 450 square kilometers, this park boasts around 250 species of avifauna and 22 distinct species of mammals. The park is termed as a natural habitat for white tigers and also renders haven to several wildlife species such as Cheetals, Bisons, Sambars and Langgors. 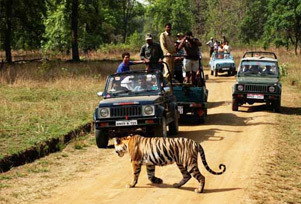 This 02 Nights and 03 Days itinerary takes the tourists to a comprehensive and gratifying tour to Bandhavgarh National Park. It is a short trip to experience the nature's bounty and cover the adventures available in the park. The major highlights of trip are safari rides in the forests, spotting several wildlife species and exploring beautiful Bandhavgarh Fort. The tour is ideal to get drenched in nature's exquisiteness and come up close to wilderness. On arrival at Umaria railway station, meet our representative who will be there for your welcome. After a warm welcome on the station, he will straightway take you to pre-booked resort. Check in at the resort and get freshen up. Enjoy mouth-watering lunch that will be served in the in-house restaurant of the resort. Rest of the day is free for leisure. During your leisure time, you can sit beside the pool and enjoy the fresh air or enjoy leisure walk in and around the resort premises. Later in the evening, enjoy hot coffee/tea with some delicious evening snacks. Take pleasure of dinner followed by an overnight stay in your resort in Bandhavgarh National Park. Today, we will start our day quite early in the morning to experience an early morning Jungle Safari. Before leaving for this adventure activity, we will sip hot served bed tea with some biscuits by the resort staff. 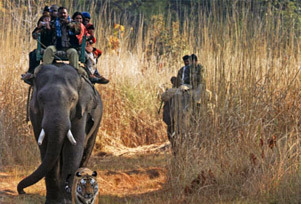 This morning jungle safari in Bandhavgarh National Park will be very exciting especially for all those who will be visiting for the first time and leave you with many unforgettable moments. After enjoy the safari for about 4 hours, we will return back to the resort for lunch. Thereafter, you can rest for some time and again get ready for another safari tour i.e. the evening safari tour which will begin at 14:30 PM in winter and 15:30 pm in summer. This way, once again you can have that kicking experience that you have experienced prior in the morning. The duration of evening safari is three hours. So, after completing your evening jungle safari, return back to the resort and have your evening tea. Enjoy lavish dinner followed by an overnight stay in the resort. In the morning after breakfast, we will check- out of the resort to drive back to Umaria railway station to board the train for your onward journey.